Shirts With Random Triangles: The Jon Gruden to USC meme has begun. With USC head football coach Lane Kiffin on the hottest of Hot Seats at the moment, it was just a matter of time before someone decided avoid the rush and commence with the "Jon Gruden to USC" meme. Why wait for Kiffin actually getting fired to start up such silliness? The person to officially kick off the meme so you don't have to? Franz Beard of Gator Country, who decides to have it both ways with the for and against Gruden's interest in the job (with Texas thrown in as well). "Gruden could have been the head coach at either Tennessee or Arkansas last year and I don’t doubt for a second that he could land just about any job that he really pushed for. Why? He’s got the personality. He’s got the football brain. He’s got the still all too hot wife. And, he would be a VERY popular choice because he is terrific with the media. 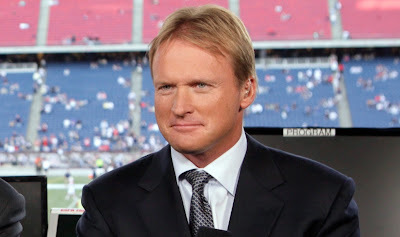 Gruden would be an ideal fit at either Texas or Southern Cal but why give up his Monday Night Football gig? He signed a 5-year contract extension with ABC/ESPN last year and he’s paid something in the neighborhood of $3-4 million. He doesn’t have to recruit. He doesn’t have to explain to the media why his star wide receiver held up a filling station. He doesn’t have to worry about soothing the ego of his star quarterback’s parents when he goes out and recruits another hotshot quarterback. As much as Chucky might want to coach, there are just too many good reasons for him to stay right where he is." Beard's real first choice would be Miami HC Al Golden, with Fresno State's Tim DeRuyter in second. Both perfectly sound candidates for the still-not-vacant USC coaching job. But seriously, where's the fun in that? Besides, since Beard's a Florida blogger, he'd probably rather see Gruden in Gainesville. At least that's my theory.